Express service 24 hours a day, 365 days a year. Sending goods to the other side of the world has never been so easy and hassle free, our staff organise the production and assembly of made-to-measure packaging at your facilities, offering a 24-hour service. Call us for further details and prices. Next-day delivery before 9:00 a.m. in most cases. Ideal for services that need to arrive before the start of the working day. Priority handling of all stages for greater peace of mind. Guaranteed delivery/provision for greater peace of mind. The ideal choice for urgent shipments that have to arrive over the course of the following day (always within 24 hours). With the EMBALEX EXPRESS® service, you can save on costs while continuing to receive deliveries within fixed timeframes. Wooden packaging (natural wood in any measurements). 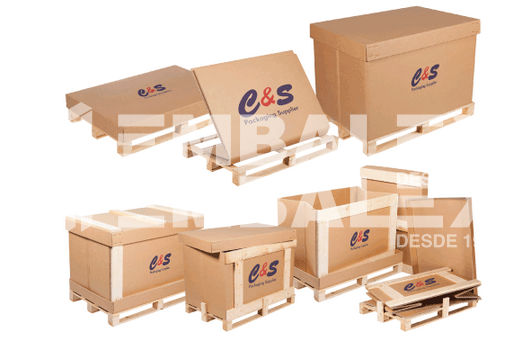 Container kits delivered complete with all elements (easy to assemble, height adjustable, pallets treated according to ISPM N-15 certificate).